TAG's new smartwatch is crazy expensive! Remember that time the world thought Apple had gone mad because it launched a $17,000 Apple Watch Edition? 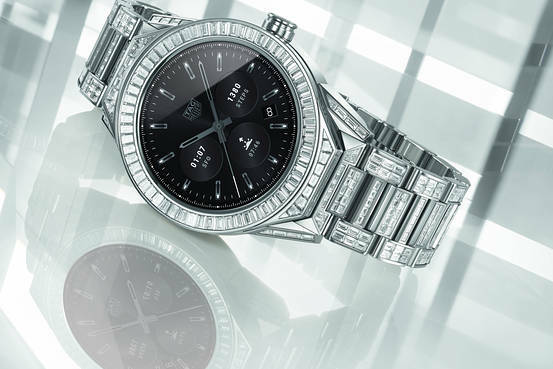 That figure is dwarfed by the price of TAG Heuer’s new luxury smartwatch, the Connected Modular 45. Its asking price: $198,000. By our count that’s equivalent to around 396 units of Apple’s brand new $499 cellular Apple Watch Series 4 watches. It also qualifies for the status of most expensive smartwatch in the world. So what do you get for your crazy amount of cash? For starters, there’s a case made from titanium, white gold, and diamonds. Inside, the smartwatch features baguette diamonds totaling 23.35 carats, WiFi and cellular network capability, NFC payment sensor, high-defintion AMOLED display, and Google Wear 2.0 software. Oh, and it’s water resistant, too — because who doesn’t want to go swimming or do the washing up wearing a timepiece this expensive? To be clear, a (much) cheaper version is available at just $1,000 — making this a similar strategic move to the Apple Watch Edition. But people heavily mocked Apple for its indulgence, and that now looks like a drop in the ocean compared with TAG’s crazy price tag. You can perhaps chalk it up to my not having the best part of $200,000 to drop on watch (or anything else for that matter), but I’ve never understood the appeal of crazy expensive smartwatches. A Rolex might set you back a lot, but it’s also a collector’s piece that could be passed on to your kids or your grandkids. A smartwatch that’s bought in 2018 is barely going to be functional a decade from now. Sure, this watch lets you switch to a mechanical watch mode if you want, but what’s the point? Best case scenario: Someone spots your pricey, feature-filled watch, runs up to you admiringly, and asks what model of Apple Watch that is? “Well, actually it’s an Android Wear device,” you’ll begin — and then notice they’ve shrunk back into the crowd.